England have not picked uncapped pace bowler Jofra Archer in a preliminary 15-man World Cup squad but have named him in one-day squads for games against Pakistan and Ireland. Barbados-born Archer, 24, qualified to play for England in March after a change in residency rules. He could still make the World Cup if he impresses in the pre-tournament matches as changes can be made up to 23 May. England play Ireland on 3 May before a five-match series against Pakistan. “The selection panel has been impressed with Jofra Archer’s performances in domestic and franchise cricket,” said national selector Ed Smith. Sussex’s Archer has an English father and a British passport. He became eligible to play for England on 17 March thanks to the England and Wales Cricket Board (ECB) bringing in new residency rules on 1 January. He has played only 14 one-day matches in his career but has impressed in Twenty20 cricket. 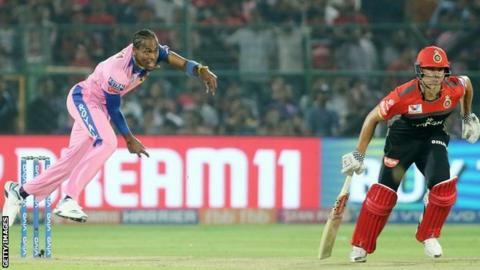 Archer, rated one of the most valuable limited-overs players in the world because of his 90mph bowling, athletic fielding and aggressive batting, is currently playing for Rajasthan Royals in the Indian Premier League (IPL), alongside England internationals Jos Buttler and Ben Stokes. Smith told him about his selection prior to the Royals’ game against Kings XI Punjab on Tuesday, where Archer took 3-15 from his four overs. The ECB said players “selected in the squads, who are currently playing in the IPL, will return to England on or before 26 April”. The preliminary World Cup squad is unchanged from the drawn winter one-day series against the West Indies, with Eoin Morgan captaining a side who are number one in the ODI rankings. Archer’s Sussex team-mate Chris Jordan has also been given a chance to break into the World Cup set-up by being named in the squads to play Ireland and Pakistan. Pace bowler Jordan, who played in England’s 3-0 Twenty20 series win in the West Indies, returns to the ODI squad for the first time since September 2016. “Chris Jordan, a regular in T20 squads over the past few years, has continued to develop as a cricketer – as we saw in the T20s in the West Indies,” said Smith. Moeen Ali, Jonny Bairstow, Jos Buttler, Ben Stokes and Chris Woakes will be rested for the ODI against Ireland in Dublin and the T20 international against Pakistan on 5 May. They will return to the squad for the five-match ODI series against Pakistan between 8 and 19 May before England open their World Cup campaign against South Africa at The Oval on 30 May. “All 17 players named in the Royal London ODIs against Pakistan can stake a claim to be in the final 15-man squad, finalised at the end of that series,” added Smith. “With regard to resting players, we are conscious of managing player workloads leading into such an important summer so that players are in the best possible condition for the World Cup. After the World Cup squad is finalised, England play warm-up matches against Australia on 25 May and Afghanistan on 27 May. These are not official ODIs. Jofra Archer has been given a chance to prove himself for the World Cup. It’s a real conundrum for the selectors; how do they give all involved in this knife-edge choice – David Willey, Woakes, Liam Plunkett, Tom Curran and possibly Joe Denly – a fair and equal chance to compete with the talented Archer. Archer, for all his T20 experience, has played only 14 one-day matches in his career. Keeping a squad of 17 happy over five make-or-break games with so much at stake will not be easy. Chris Jordan’s performances in the West Indies have given him another opportunity, while England’s party to play Ireland is essentially its T20 squad.